6842. Jennie Leota RIEGLE [scrapbook] 1, 2, 3 (Isaac Nelson RIEGLE , Daniel RIEGLE , Sarah BITLER , Samuel , Michael , Johannes ) was born on 24 Dec 1889 in Darke Co, OH. She died on 26 May 1950 in Brown Twp, Darke Co, OH. She was buried on 29 May 1950 in Greenville Cemetery, Greenville, Darke Co, OH. Jennie resided in 1900 in Brown Twp, Darke Co, OH. She worked as At School in 1900. She resided in Sep 1945 in Ansonia, Darke Co, OH. She resided in May 1950 in Ansonia, Brown Twp, Darke Co, OH. She worked as Housewife in May 1950. Jennie married Chester Harvey DERR [scrapbook] 1, 2, 3, son of Chester F DERR and Frances J FRAZEY, about 1909. Chester was born on 15 Nov 1890 in OH. He died on 4 Jun 1950 in Brown Twp, Darke Co, OH. He was buried on 7 Jun 1950 in Greenville Cemetery, Greenville, Darke Co, OH. Chester resided in Jun 1950 in Ansonia, Brown Twp, Darke Co, OH. He worked as Farmer - Farming in Jun 1950. Kenneth DERR 1 was born on 13 Jan 1910 in Darke Co, OH. He died in Feb 1966 in OH. Nevin DERR 1 was born on 3 Feb 1911 in Darke Co, OH. He died in Oct 1973 in Ansonia, Darke Co, OH. Nevin was issued a social security number in OH. He resided in 1973 in OH 45303. 6843. J Elmer RIEGLE 1, 2 (Isaac Nelson RIEGLE , Daniel RIEGLE , Sarah BITLER , Samuel , Michael , Johannes ) was born on 18 Apr 1892 in Darke Co, OH. He died on 18 Nov 1959 in Greenville, Darke Co, OH. J Elmer RIEGLE-11679 resided in 1900 in Brown Twp, Darke Co, OH. He worked as At School in 1900. He resided in Sep 1945 in Ansonia, Darke Co, OH. J Elmer RIEGLE married Merti May FREYMUTH 1, daughter of John Morris FREYMUTH and Sarah Jane LIGHT, on 15 Mar 1913 in Darke Co, OH. Merti was born on 16 Jul 1886 in Lightsville, Darke Co, OH. She died in Nov 1973 in Ansonia, Darke Co, OH. Merti was issued a social security number in OH. She resided in 1973 in OH 45303. 12216 F i Mary Ann RIEGLE. 12217 F ii Matta RIEGLE. 6844. Lydia Mae RIEGLE 1, 2 (Isaac Nelson RIEGLE , Daniel RIEGLE , Sarah BITLER , Samuel , Michael , Johannes ) was born on 9 Feb 1893 in Darke Co, OH. Lydia resided in 1900 in Brown Twp, Darke Co, OH. She resided in 1920 in Allen Twp, Darke Co, OH. She resided in 1930 in 400 S Main St, Veedersburg, Fountain Co, IN. She resided in Sep 1945 in Hammond, IN. Lydia married Thomas J BEAM 1, 2, son of Reuben K BEAM and Sarah C RUE, about 1912. Thomas was born on 19 Sep 1887 in Brown Twp, Dark Co, OH. Thomas resided in 1900 in Ansonia, Darke Co, OH. He resided in 1920 in Allen Twp, Darke Co, OH. He worked as Farmer - Farming in 1920. He resided in 1930 in 400 S Main St, Veedersburg, Fountain Co, IN. He worked as Clergyman - Nazarene in 1930. Toletha BEAM was born on 17 Mar 1914 in OH. She died on 6 Sep 1985 in Broward Co, FL. Toletha resided in 1920 in Allen Twp, Darke Co, OH. She resided in 1930 in 400 S Main St, Veedersburg, Fountain Co, IN. She was issued a social security number before 1951 in IN. She resided in Sep 1985 in Ft Lauderdale, Broward Co, FL. Reuben I BEAM was born about 1917 in OH. He died in Jul 1968 in Escambia Co, FL. Reuben resided in 1920 in Allen Twp, Darke Co, OH. He resided in 1930 in 400 S Main St, Veedersburg, Fountain Co, IN. Solomon Daniel BEAM was born on 8 Sep 1921 in OH. He died on 27 Oct 1972 in Escambia Co, FL. Solomon resided in 1930 in 400 S Main St, Veedersburg, Fountain Co, IN. He was issued a social security number before 1951 in IN. 6845. Arthur Daniel RIEGLE 1, 2 (Isaac Nelson RIEGLE , Daniel RIEGLE , Sarah BITLER , Samuel , Michael , Johannes ) was born on 24 Oct 1895 in Darke Co, OH. He died on 24 Jan 1979 in Manatee Co, FL. Arthur resided in 1900 in Brown Twp, Darke Co, OH. He resided in Sep 1945 in Ansonia, Darke Co, OH. He was issued a social security number before 1951 in OH. He resided in 1979 in Greenville, Darke Co, OH. Arthur married Ethel M YOCKEY 1, 2, daughter of William YOCKEY and Stella, on 24 Jun 1916 in Darke Co, OH. Ethel was born on 27 Jan 1894 in Darke Co, OH. She died on 25 Feb 1995 in New Weston, Darke Co, OH. Ethel was issued a social security number in OH. She resided in Mar 1940 in Ansonia, Darke Co, OH. She resided in 1995 in OH 45348. She resided in Feb 1995 in 200 Marker Rd, Versailles, OH. + 12221 F i Roxine RIEGLE. + 12222 F ii Betty RIEGLE. + 12223 F iii Melissa L RIEGLE. + 12224 F iv Carol RIEGLE. 6846. John C RIEGLE 1, 2 (Isaac Nelson RIEGLE , Daniel RIEGLE , Sarah BITLER , Samuel , Michael , Johannes ) was born on 7 Aug 1897 in Darke Co, OH. He died in Apr 1972 in Greenville, Darke Co, OH. John resided in 1900 in Brown Twp, Darke Co, OH. He worked as Farmer - General in 1920. He resided in 1930 in Brown Twp, Dark Co, OH. He worked as Farmer - General Farming in 1930. He resided in Sep 1945 in Ansonia, Darke Co, OH. John married June R VANAUSDAL 1. John also married Myrtle I SEBRING 1, daughter of Charles A SEBRING and Emma WICKERT, on 22 Dec 1917 in Darke Co, OH. Myrtle was born on 1 Sep 1877 in North Starr, Darke Co, OH. She died in 1934 in Darke Co, OH. Myrtle resided in 1920 in Brown Twp, Dark Co, OH. She resided in 1930 in Brown Twp, Dark Co, OH. John also married Eleanor BAUGHMAN 1 about 1935. Eleanor was born in 1904 in Darke Co, OH. She died in 1963 in Darke Co, OH. 12225 M i Gene RIEGLE. 12226 M ii Jack RIEGLE. 6847. Nellie N RIEGLE 1, 2, 3 (Isaac Nelson RIEGLE , Daniel RIEGLE , Sarah BITLER , Samuel , Michael , Johannes ) was born on 7 Nov 1899 in Darke Co, OH. She died on 1 Sep 1945 in At Home, Ansonia, Darke Co, OH. She was buried on 6 Sep 1945 in Greenville Cemetery, Greenville, Darke Co, OH. Nellie resided in 1900 in Brown Twp, Darke Co, OH. 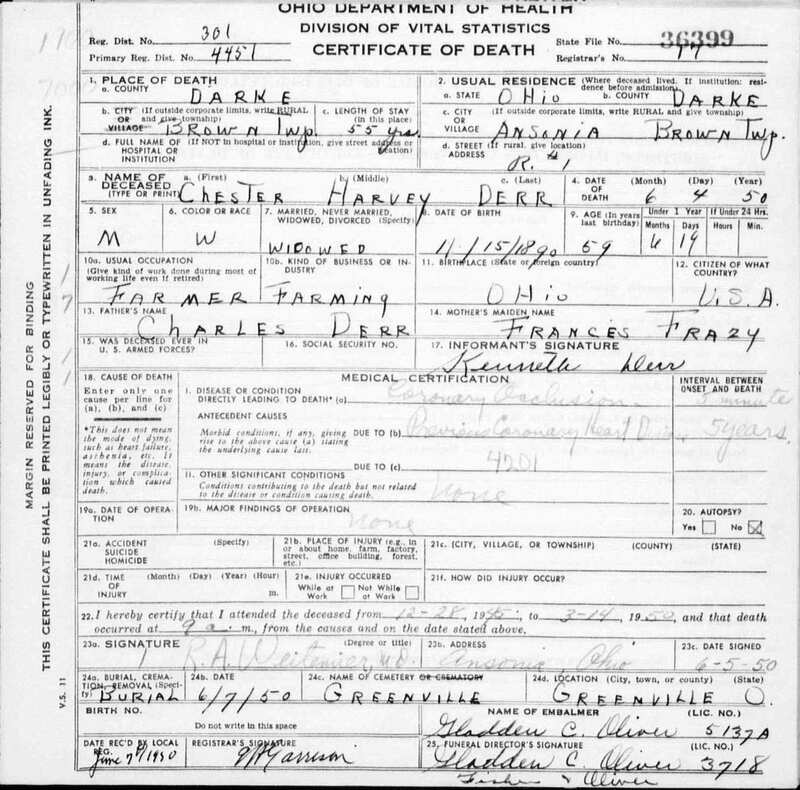 Nellie married Theodore THARP Sr 1, son of Elmer THARP and Fannie BROWN, on 6 Jun 1925 in Darke Co, OH. Theodore was born on 4 Oct 1901 in Greenville, Darke Co, OH. He died in Oct 1966 in Greenville, Darke Co, OH. 12227 F i Phyllis THARP. 12228 F ii Barbara THARP. 12229 F iii Ann May THARP. 12230 F iv Nancy Jane THARP. Theodore THARP Jr was born on 6 May 1930. He died on 23 Apr 2000. Theodore resided in Sep 1945 in Ansonia, Darke Co, OH. He was issued a social security number before 1951 in OH. He resided in Apr 2000 in Union City, Darke Co, OH. 6848. Ada F RIEGLE 1, 2, 3, 4 (Lewis Daniel RIEGLE , Daniel RIEGLE , Sarah BITLER , Samuel , Michael , Johannes ) was born on 25 Sep 1892 in York Twp, Darke Co, OH. She died in Mar 1980 in Palmetto, FL. Ada was issued a social security number in FL. She resided in 1930 in W Hillcrest Ave, Harrison Twp, Montgomery Co, OH. She resided in Dec 1940 in RFD 4, Greenville, Darke Co, OH. She resided in 1940 in Winchester Pike, Washington Twp, Darke Co, OH. She resided in 1980 in FL 33561. Ada married Robert L KLEFECKER Sr 1, 2, 3, 4 on 20 Mar 1920 in Darke Co, OH. Robert was born on 19 Nov 1900 in Darke Co, OH. He died on 19 Oct 1988 in Palmetto, FL. Robert was issued a social security number in OH. He resided in 1930 in W Hillcrest Ave, Harrison Twp, Montgomery Co, OH. He worked as manager - retail grocery store in 1930. He resided in Dec 1940 in RFD 4, Greenville, Darke Co, OH. He resided in 1940 in Winchester Pike, Washington Twp, Darke Co, OH. He worked as farmer - farm in 1940. He resided in 1988 in FL 34221. 12232 M i Robert L KLEFECKER Jr.
Robert married Betty Jean CONNER. Betty was born on 17 Jul 1926 in IN. She died on 15 May 1991 in Henderson Co, NC. She was buried in Forest Lawn Memorial Park, Hendersonville, Henderson Co, NC. Betty was issued a social security number . Robert also married Patricia HAMMOND "Pat", daughter of Ernest Edward HAMMOND and Carolyn TOLBERT. Pat was born on 20 Nov 1931 in Montgomery, Montgomery Co, AL. She died on 2 Nov 2010 in Newport, TN. She was buried in Forest Lawn Memorial Park, Hendersonville, Henderson Co, NC. Helen Joan KLEFECKER 1, 2 was born on 25 May 1927 in OH. She died on 9 Sep 1998 in Washington, Beaufort Co, NC. Helen resided in 1930 in W Hillcrest Ave, Harrison Twp, Montgomery Co, OH. She resided in 1940 in Winchester Pike, Washington Twp, Darke Co, OH. She was issued a social security number . Helen married CONNOR 1. CONNOR died before 1998. Stuart R KLEFECKER 1, 2 was born on 12 Jun 1930 in Dayton, Montgomery Co, OH. He died on 26 Feb 2006 in Bluffton, Wells Co, IN. He was buried in Darrell Wayne Grove, Poneto, Wells Co, IN. Stuart resided in 1940 in Winchester Pike, Washington Twp, Darke Co, OH. He worked as truck driver with Indiana Department of Transportation from 1969 to 1994. He served in the military with Indiana Air National Guard, 122nd Fighter Sqadron. He was a member of American Legion Post 111. Stuart married Sharlee M FATE on 27 Oct 1951 in Wells Co, IN. + 12235 M iv Walter Richard KLEFECKER Sr was born on 14 May 1934. He died on 19 Nov 2003. 6849. George Howard RIEGLE 1, 2 (Lewis Daniel RIEGLE , Daniel RIEGLE , Sarah BITLER , Samuel , Michael , Johannes ) was born on 24 Apr 1895 in York Twp, Darke Co, OH. He died in Feb 1954 in Greenville, Darke Co, OH. George resided in Dec 1940 in Royal Oak, MI. George married Mary Elita 1. 12236 M i George Howard RIEGLE. 12237 F ii Marilyn RIEGLE. 12238 F iii Helen RIEGLE. 6850. Rhoda Helen RIEGLE 1, 2 (Lewis Daniel RIEGLE , Daniel RIEGLE , Sarah BITLER , Samuel , Michael , Johannes ) was born on 29 Jan 1900 in Darke Co, OH. Rhoda resided in 1930 in 2647 Kennedy Ave, Dayton, Montgomery Co, OH. She resided in Dec 1940 in Dayton, Montgomery Co, OH. Rhoda married Hobart F GRAY 1, 2 on 4 Jan 1921 in Darke Co, OH. Hobart was born about 1899 in Darke Co, OH. He died in Feb 1982 in New Lebanon, OH. Hobart was issued a social security number in OH. He resided in 1930 in 2647 Kennedy Ave, Dayton, Montgomery Co, OH. He worked as Foreman - Car Registers in 1930. He resided in Dec 1940 in Dayton, Montgomery Co, OH. He resided in 1982 in New Lebanon, OH. James Lewis GRAY 1 was born on 10 Oct 1921 in Darke Co, OH. He died in Feb 1982 in New Lebanon, OH. James resided in 1930 in 2647 Kennedy Ave, Dayton, Montgomery Co, OH. 6851. 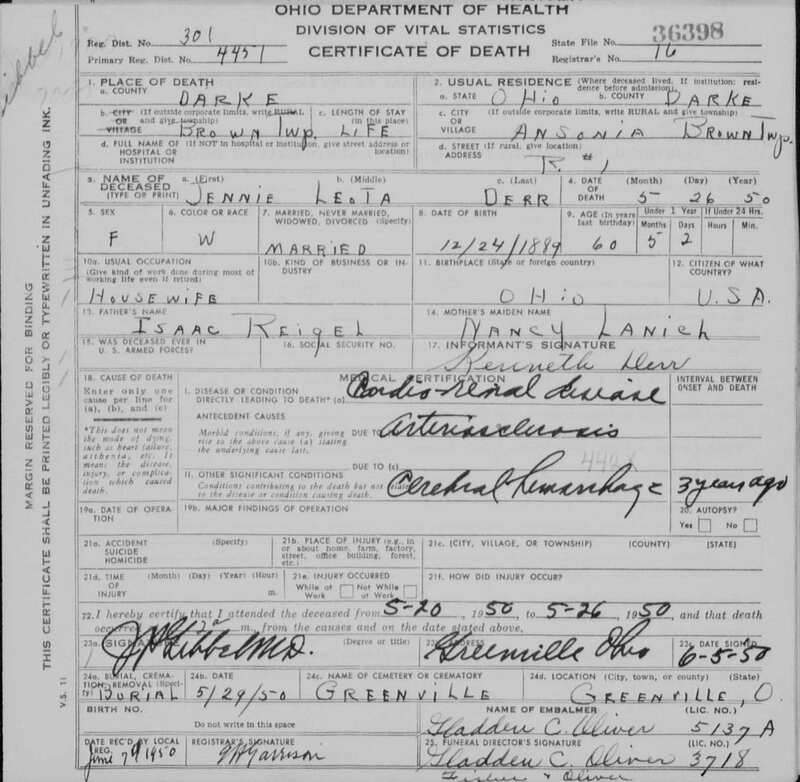 Oscar Leroy RIEGLE 1, 2 (Lewis Daniel RIEGLE , Daniel RIEGLE , Sarah BITLER , Samuel , Michael , Johannes ) was born on 27 Mar 1908 in Brown Twp, Darke Co, OH. He died in 1955 in Greenville, Darke Co, OH. Oscar resided in Dec 1940 in Greenville, Darke Co, OH. Oscar married Mary Azalea POLING 1 on 16 Aug 1933 in Crown Point, IN. Mary was born on 29 Jul 1911. She died on 5 Jan 1989 in Tampa, FL. Mary was issued a social security number in OH. She resided in 1989 in FL 33604. 12240 F i Julie Lee RIEGLE. 12241 M ii Lewis Daniel RIEGLE. 6852. Lewis Lester "Lester" RIEGLE 1, 2 (Lewis Daniel RIEGLE , Daniel RIEGLE , Sarah BITLER , Samuel , Michael , Johannes ) was born on 19 Jan 1912 in Darke Co, OH. He died on 26 Jun 1995 in Greenville, Darke Co, OH. He was buried on 30 Jun 1995. Lester resided in Dec 1940 in RFD 5, Greenville, Darke Co, OH. He resided in Jun 1995 in 750 Chestnut St, Greenville, Darke Co, OH. Lester married Beatrice I IMLER 1, daughter of John IMLER and Nellie VIETS, on 7 Dec 1938 in Darke Co, OH. Beatrice was born on 24 Apr 1913 in Darke Co, OH. She died on 1 Nov 1983 in Greenville, Darke Co, OH. 12242 F i Linda Bea RIEGLE. 6853. Lena RIEGLE 1 (Peter Hudson RIEGLE , Daniel RIEGLE , Sarah BITLER , Samuel , Michael , Johannes ) was born on 21 Jan 1904 in York Twp, Darke Co, OH. She died on 31 Oct 1989 in Versailles, OH. Lena was issued a social security number in OH. She resided in 1989 in OH 45380. Lena married Herman BICKEL 1, son of Frank W BICKEL and Ollie KNOLL, on 23 Dec 1922 in Darke Co, OH. Herman was born on 2 Oct 1899 in Darke Co, OH. He died in Jun 1969 in Versailles, OH. Herman was issued a social security number in OH. He resided in 1969 in OH 45380. 12243 M i Norris BICKEL.